Closing the virtuous circle: IU Southeast receives an important grant from the Community Foundation of Southern Indiana for a poverty simulation. From left: Betty Russo, vice chancellor for advancement; Kelly Ryan, dean of the School of Social Sciences; Judy Myers, associate professor of nursing; Jean Borger, IU Southeast grants coordinator; Donna Bowles, dean of the School of Nursing; Crystal Gunther, director of community philanthropy for the Community Foundation of Southern Indiana; Dr. Ray Wallace, chancellor of IU Southeast. (NEW ALBANY, Ind. )—How do you apply for food stamps? Can you open a bank account when you live in your car? How do you prepare for a job interview when you have no place to bathe? If you are a teenager in a family of three, living with a single parent who is unemployed, what could you do to help make ends meet? Challenges like these face members of our community―and even members of our student body―every day. They also touch the lives of IU Southeast graduates working in nursing, education, government and nonprofits. 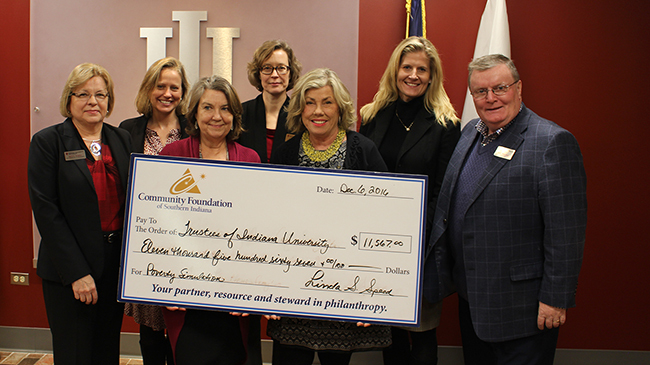 To better sensitize students, the university and the community to what it means to be without means, the Community Foundation of Southern Indiana (CFSI) has awarded a grant in the amount of $11,587.00 to IU Southeast to support an ongoing poverty simulation. In the simulation, students from the Schools of Nursing, Education and Social Sciences will play the roles of disadvantaged persons of varying ages, genders and ethnicities, trying to provide basic material well-being for their families, or simply to survive. In order to meet their needs, they will interact with representatives of government agencies, utility companies, supermarkets and nonprofits. To lend verisimilitude, these representatives will be played by volunteers from the New Albany Housing Authority (NAHA) with personal experience of being on the other side of the table. These volunteers will also bring their perspectives to the group discussion that follows each simulation. In contrast to poverty simulations offered as one-off workshops, the IU Southeast project will be embedded in the curriculum of the three schools. Pre- and post-instructional survey design and curriculum planning are already underway, and six faculty members will receive facilitator training in March. Social science students will take part in simulations in the current spring semester. Also beginning with the current semester, undergraduate education teacher candidates will be required to participate as one aspect of their seminars, and graduate education students will be invited to participate as well. The School of Nursing will implement its first simulation beginning in the fall. In all, 250 students will go through the process each year. But the simulations aren’t limited to students. IU Southeast administrators, community groups and nonprofits will also be invited to participate, and interest is already running high. It is expected that up to 150 community members and 50 volunteer facilitators will go through the program each year. The impact on the community transcends these numbers both quantitatively and qualitatively. The IU Southeast proposal estimates that up to 40,000 people will benefit from the program over a five-year period. The CFSI recognized in the IU Southeast proposal an opportunity to be proactive in supporting an initiative that directly affects the quality of life in its service area, according to Crystal Gunther, CFSI director of community philanthropy. Gunther helps to manage the flow of grant assistance from the Foundation, which was created to be a permanent financial resource for the community through the support of many community leaders, donors and a generous seed gift from the Lilly Endowment, Inc. The Foundation also collaborates with IU Southeast on efforts such as Education Matters Southern Indiana, an academic attainment initiative designed to help the region’s 40,000 working adults who graduated high school but did not finish college to find ways to gain their undergraduate degrees. For Gunther, such partnerships play to the strengths of the Foundation. “We see ourselves not just as a financial resource, but as a mutual convener who can bring a lot of parties to the table to work together for collective impact,” Gunther said. This is especially true of the poverty simulation. While various members of the other schools have had experience with simulations of this kind over the years, the School of Nursing is the mover behind this project, having seen the value through a similar exercise organized by The Common Experience. The nursing profession is directly, deeply and daily affected by poverty in the community. Bowles cites the lack of insurance coverage, poor access to services and high costs as some of the chief challenges faced by the poor in the healthcare arena. Families in rural areas such as Southern Indiana face additional barriers due to limited mental health and addiction/substance abuse services, dental and obstetrical care and allied health amenities such as physical therapy or rehabilitative medicine. Cultural differences compound the problems, according to Bowles. 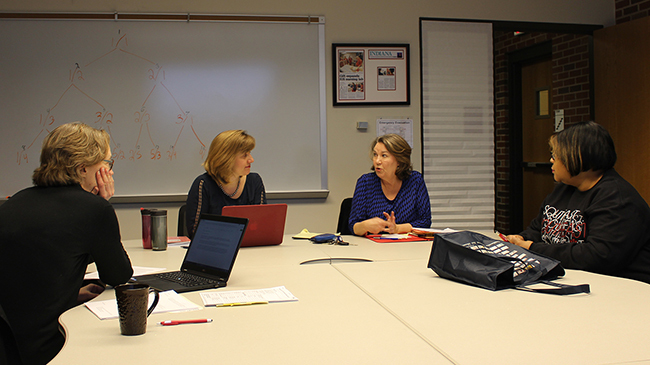 Laying the groundwork: IU Southeast Grants Coordinator Jean Borger, Melissa Fry, Judy Myers and Cathy Johnson discuss evaluation criteria for the poverty simulation in a preliminary meeting. Supporting the School of Nursing will be the Schools of Social Sciences and Education. Graduates of both schools will have direct contact with individuals living in poverty. Based on past experience, the deans and participating faculty members expect the exercise to sensitize students to the needs and concerns of the poor. They know that success in these fields post-graduation will likely depend on the students’ ability to empathize with disadvantaged members of the community. “Our students come from a wide range of economic backgrounds, and this will help many gain insight into the real challenges that people face when they don’t have resources or support systems to help them overcome the bumps that all of us come across,” said Melissa Fry, assistant professor of sociology and director of the Applied Research and Education Center (AREC). For Fry, embedding the simulation in curriculum will give students an opportunity to think through the dynamics of poverty, how it operates at the community level and how it intersects with other forms of inequality. It will also help students who have themselves faced challenging circumstances to understand the structural dynamics of their situation. The School of Education has a long history of attending to classroom issues rooted in poverty, chiefly within its diversity requirement but also through participating in past simulations. Cathy Johnson, assistant professor of education, believes it’s beneficial for candidates to immerse themselves in the poverty exercise, especially as so many know it only from books, not from their personal experience. This is especially important in a teacher workforce that is increasingly less diverse than the average classroom. Judy Myers, associate professor of nursing, agrees that overcoming bias is a major goal of the simulation, and sees this as aligning with the mission of the School of Nursing. Previous exercises involving the School of Nursing and the School of Education have reliably produced this transformative outcome, as students uncover not only the realities of life from the perspective of an unfamiliar segment of society, but the realities of their own biases, either acknowledged or unacknowledged. The complex insights and emotions are revealed in self-reflection essays that follow and are an important part of the simulation. Omnipresent and multilayered, poverty is best addressed with an approach that mirrors its nuances. A solid first step is igniting a human connection through first-person experiences like the simulation, to engender changes in the perspective of those who are in a position to have an impact in the community. For Myers, the simulation enables students to put themselves in someone else’s shoes. And not just any shoes—preferably dirty ones. She recalls speaking with a student who had built her capstone project around her work in an emergency room. When asked what she had learned from the experience, she became thoughtful, then responded that the capstone had inspired her to buy her elderly mother a new pair of shoes. “I noticed that people with clean shoes get treated differently than people with dirty shoes,” she said. Nearly all IU Southeast graduates will choose to live and work in Kentuckiana, a region with a significant number of individuals and families affected by poverty. Sensitizing both students and the community to the structural causes and impacts of poverty, as well as the subtleties of how it plays out in the lives of real people can contribute to creating a more inclusive and caring social environment. The Community Foundation of Southern Indiana (CFSI) is a tax-exempt public charity that manages over $106 million in charitable assets and administers over 240 funds created by individuals, families, businesses and non-profit organizations―each of which supports the charitable intent of the donor who established the fund. The Community Foundation provides the structure that allows its donors to support their own unique charitable objectives in ways that are easy, flexible and meaningful. Through the administration of charitable funds and distribution of grants, the Community Foundation of Southern Indiana supports the community and addresses Southern Indiana’s most pressing needs. Homepage photo: Cathy Johnson, Melissa Fry and Judy Myers are three of the faculty members facilitating the IU Southeast poverty simulation. They will be joined by Donna Bowles, Lisa Hoffman and Veronica Medina.